Another year, another late start on my gift knitting! It seems this always happens but I've finally got around to knitting my first Christmas present. 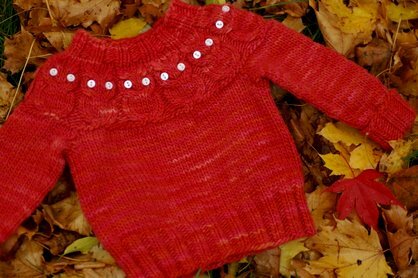 I really want to knit each of my nieces something warm to wear for the holidays, and this little sweater will be perfectly adorable on the newest member of my sister's family. I really like this pattern since it is nicely laid out and has a really wide range of sizes included. 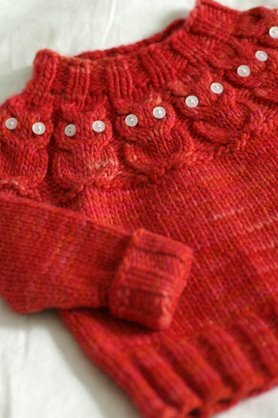 I knit the smallest size, 6 months, and love how I could use the same pattern to knit a matching sweater for both of my other nieces, ages 3 and 5. Another big plus is that the design is unisex and I am planning on knitting another version in a gender neutral color just in case I need a last minute gift for a baby shower. 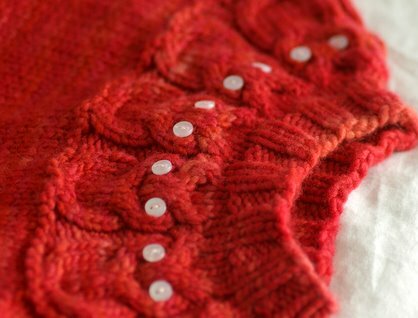 The options are pretty much endless since the pattern is written for worsted weight yarn and the pattern can be easily customized by adding embroidery. When I was picking out the yarn to use, I originally thought that I would need just one skein of Malabrigo worsted to complete the smaller size. Fortunately I had two on hand because I ran out of yarn with about 3 rows left in the owl cable pattern, and now have the second skein wound with plenty left to knit a matching hat/booties/mittens/toy. The color also got better and better as I knit with it. In the skein it looked almost pure red, but after I started knitting with it, the subtle hints of orange and pink really started to show. I feel lucky to have found the perfect sized buttons so easily. Snow Goose Yarns in Milton, MA has a really good selection of adult and children's buttons and thankfully they had just enough on hand! 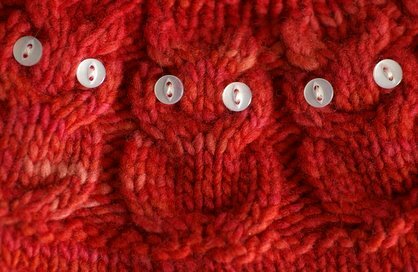 I needed 24 buttons, and found that buttons 8 mm in diameter were the perfect fit. It definitely took a bit of patience sewing them all on, but the finished look is really worth it. There are a few other Kate Davies patterns that I love. 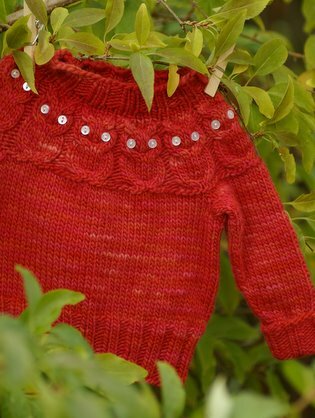 I've always wanted to knit Camdyn a Paper Dolls sweater which includes adult and children's sizes. Her recently published Tortoise and Hare gauntlets are super cool and I think they'd make a great Christmas gift. If you haven't looked through all of Kate's designs, you should definitely check them out!